WINTER 2018 9 T H E C L I M B CELEBRATING 50 YEARS IN ANIMATION, ROBERT ALVAREZ LOOKS BACK AT THE JOURNEY THAT STARTED IN AN UNLIKELY PLACE—THE DUMPSTER. As a 13-year-old kid back in the early '60s becoming an animator seemed almost as far reaching as becoming an astronaut. Fortunately for Robert Alvarez, a serendipitous friendship with a 7th-grade boy named Tim Walker changed the course of his life. "We used to ride our bikes over to Hanna- Barbera and just take stuff out of the trash cans. Occasionally, you'd get chased away," says Alvarez, who has been at Cartoon Network since it was created 26 years ago. "We were obsessed with obtaining artwork from cartoons. I still have cels from that time period." These dumpster diving missions to the various cartoon studios fed the flame that was already burning inside Alvarez. One day while forming up at his Catholic school he started talking about some cartoon he had watched on TV. A kid behind him scoffed at this childish behavior. "I turned to him and I said, 'Yes, and some day I'm going to be an animator,' but I had no idea how that would even happen but it did," he remembers, shaking his head at his youthful bravado. Alvarez has certainly shown his mettle as he celebrates 50 years in the industry, no small feat for anyone in animation. 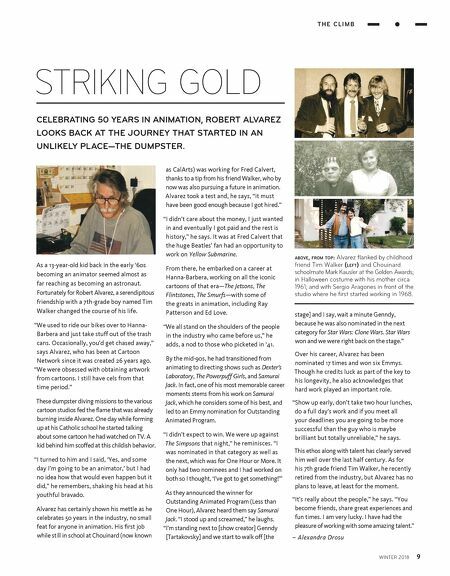 His first job while still in school at Chouinard (now known as CalArts) was working for Fred Calvert, thanks to a tip from his friend Walker, who by now was also pursuing a future in animation. Alvarez took a test and, he says, "it must have been good enough because I got hired." "I didn't care about the money, I just wanted in and eventually I got paid and the rest is history," he says. It was at Fred Calvert that the huge Beatles' fan had an opportunity to work on Yellow Submarine. From there, he embarked on a career at Hanna-Barbera, working on all the iconic cartoons of that era—The Jetsons, The Flintstones, The Smurfs—with some of the greats in animation, including Ray Patterson and Ed Love. "We all stand on the shoulders of the people in the industry who came before us," he adds, a nod to those who picketed in '41. By the mid-90s, he had transitioned from animating to directing shows such as Dexter's Laboratory, The Powerpuff Girls, and Samurai Jack. In fact, one of his most memorable career moments stems from his work on Samurai Jack, which he considers some of his best, and led to an Emmy nomination for Outstanding Animated Program. "I didn't expect to win. We were up against The Simpsons that night," he reminisces. "I was nominated in that category as well as the next, which was for One Hour or More. It only had two nominees and I had worked on both so I thought, 'I've got to get something!'" As they announced the winner for Outstanding Animated Program (Less than One Hour), Alvarez heard them say Samurai Jack. "I stood up and screamed," he laughs. "I'm standing next to [show creator] Genndy [Tartakovsky] and we start to walk off [the stage] and I say, wait a minute Genndy, because he was also nominated in the next category for Star Wars: Clone Wars. Star Wars won and we were right back on the stage." Over his career, Alvarez has been nominated 17 times and won six Emmys. Though he credits luck as part of the key to his longevity, he also acknowledges that hard work played an important role. "Show up early, don't take two hour lunches, do a full day's work and if you meet all your deadlines you are going to be more successful than the guy who is maybe brilliant but totally unreliable," he says. This ethos along with talent has clearly served him well over the last half century. As for his 7th grade friend Tim Walker, he recently retired from the industry, but Alvarez has no plans to leave, at least for the moment. "It's really about the people," he says. "You become friends, share great experiences and fun times. I am very lucky. I have had the pleasure of working with some amazing talent." – Alexandra Drosu STRIKING GOLD above, from top: Alvarez flanked by childhood friend Tim Walker (left) and Chouinard schoolmate Mark Kausler at the Golden Awards; in Halloween costume with his mother circa 1961; and with Sergio Aragones in front of the studio where he first started working in 1968.